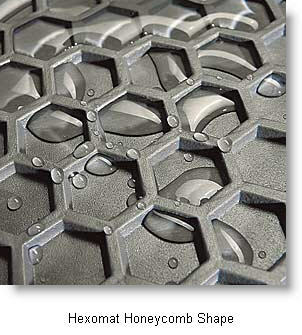 Hexomat Car Floor Mats Work Like Bees to Keep Your Car Dry! Hexomat Car Mats from Intro-Tech don't give dirt, mud, water or spilled soft drinks a chance to dirty your vehicles floor. Intro-Tech has over 10,000 custom fit, computer cut patterns to fit the front, rear, cargo and trunk areas of your vehicle. The honeycomb shaped wells of the Hexomat can swallow 6 to 8 cups of liquid – amazing - that’s a super giant soda from your favorite convenience store! These floor mats are molded from a space-age rubber composite which is both flexible and durable. They won’t fade, crack or deteriorate. A low profile design is custom contoured to the floor pan of your cars specific year, make and model. The honeycomb shaped wells clean up easily with mild soap and a hose - just make sure you take these mats out of the car first before cleaning. I bet the bees wish it were this easy. 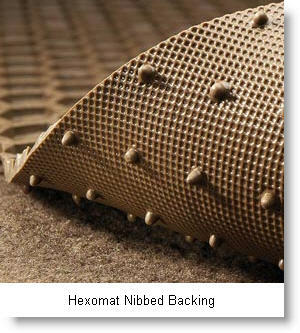 A nibbed backing prevents this mat from slipping on the vehicles carpet. This is a great all season mat for your car. But, be warned, when these mats are removed from their packaging they may smell a little. Let them air out for awhile before you put them in your car. These mats can hold enough water to drive up the humidity in your car, so using a Universal Absorbent Floor Mat may be a good idea to help keep moisture and humidity levels down. So, how do other people rate these mats? You've heard my opinion, now how about the opinions of real life owners of the Intro-Tech Hexomat Floor Mat. Just check out my Where to Buy page for lots of vendors who sell this mat and their customers who have reviewed them. And remember to thank the honeybee for the design of this floor mat!